One of the guiding principles of fair trade is environmental sustainability, and caring for the earth and each other is at the center of what we do. At our stores, we carry products that are very obviously eco-friendly and up-cycled—like animals made of recycled cans, bags made of discarded cement bags, or bowls made of old bike chains. 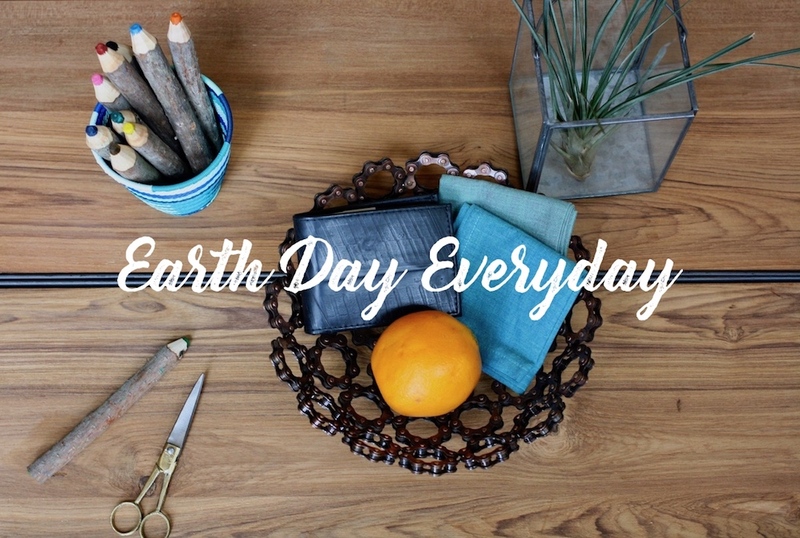 These products are easy to feature when we celebrate Earth Day each year! But most of our products actually have an environmentally friendly component that you may not see. In artisan communities in all corners of the world, there is much that goes on behind the scenes to respect the earth and to ensure a viable future. We have heard so many stories of catching rain water from roofs, creating water filtration systems in areas of drought, using scraps of cloth that would otherwise be discarded to make beautiful throws, fun garlands, and even prosperity hens. Bet you never thought you could listen to tunes on your phone or chat with a friend while keeping your hands free, sustainably! “Booziks” are fair trade, eco-friendly speakers made from a stalk of bamboo. Stick your phone in the slot to hold it up, and the sound is amplified—no cords or batteries needed. The booziks are made in Bosang, Thailand which neighbors the larger city of Chiang Mai, a place known for its handicrafts. Bamboo grows abundantly in Thailand and as soon as its cut, it quickly grows back. And how is it possible for a leather journal to be sustainable? Believe it or not, the leather journals that we carry are earth-friendly from the inside out. They are made from animals who have died from natural causes; mostly cows. In the vegetarian region in Rajasthan, India, animals are not killed for food. 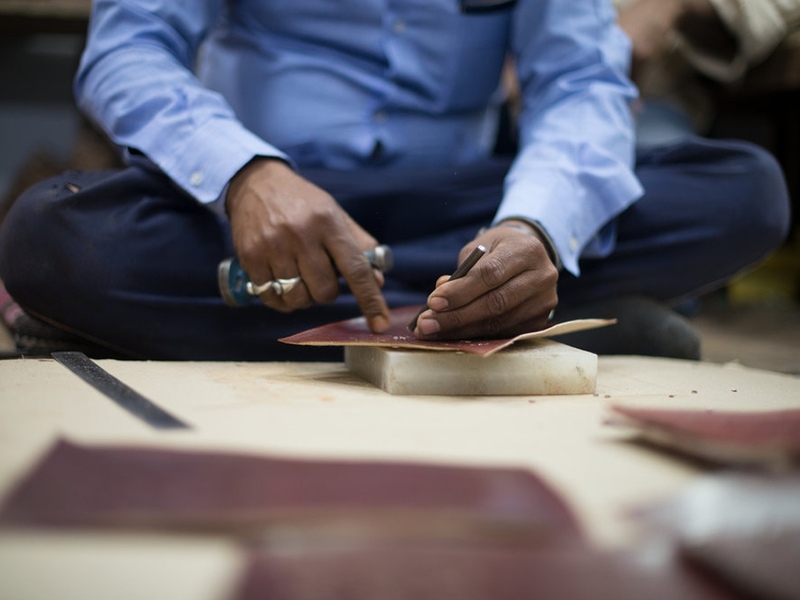 Leather craft and tooling is a skill passed on from generation to generation in this region. The leather is dyed using a vegetable tanning method with water-based dyes and oils. This protects the environment and tannery workers from toxic chemicals. It doesn’t stop there! The paper inside is 100% recycled cotton paper made in the same region in India. Discarded cotton scraps are collected from the textile factories. The cotton is broken down into fibers using a wheel press and then soaked. The pulp is strained, pressed into pages, and hung to dry. The pages are ironed and ready to be threaded into the journals! The entire process is tree-free, non-toxic, and conserves and filters water for reuse in irrigation. Cotton paper-making is all done by hand, which provides many with a job to do. The artisans receive regular training, microfinance, education, and health assistance. When you buy fair, you can feel confident that you are investing in conservation efforts everywhere. It’s Earth Day everyday!